The good news is there are speech apps out there that will have your kids chomping at the bit to do their homework. The bad news: Your kids will keep begging to use your iPad after they try these apps. Language comes so naturally to many of us. But for some kids, communication is a struggle. Parents and speech therapists have to wrestle with these kids to practice their language skills. And lots of repetition is the key to success. Educational apps can help ease that struggle. In fact, at my house, the homework blues have been replaced with setting limits on homework app time. 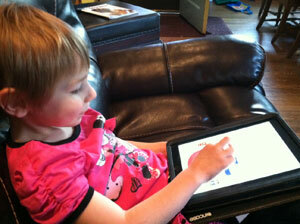 My youngest, a curious preschooler, also loves these apps, and we only have one iPad to go around. Akron Children’s speech pathologist Lisa Gonidakis, CCC-SLP, recommends these Photo Touch apps to help your child enhance her speech and language skills. They rely on sight, sound and touch to help children learn and stay engaged. You can adjust the settings to include only the concepts and objects that are appropriate for your child. Preschool Games – Farm Animals: This easy-to-use app is ideal for children ages 0 to 6. Kids follow the prompt to identify the named object. Every time your child answers three questions in a row correctly, the app jumps to the next level and starts to display one more item per page. This app is free, so it’s a good one to start with to see if you, or even more importantly, your child likes the format. Sight Words: This Photo Touch app’s “interface is so easy to use that even a 9 month old baby will delight in using this app.” Kids are encouraged to identify sight words from a group of words on the screen. The narrator reads a word and the child has to identify which word he heard. When he gets the answer right, he is rewarded with praise, including phrases like “Sweet!” This app is also free. Toddler Games Toys: This app helps children ages 0-6 learn words and objects by sight, sound and touch. It’s great for receptive and expressive vocabulary and photo discrimination. As with the other Photo Touch apps, you can also customize it with your own voice and images. This app costs 99 cents. Kids Learning: This Photo Touch Concepts app offers a fun way to reinforce contrasts. It covers left versus right, large-medium-small, above and below, and different versus alike. Another neat feature is that you can use your own voice to reward your child for the correct answer. This Kids Learning – Photo Touch Concepts app is 99 cents. While it’s easy to let kids immerse themselves in these apps, Gonidakis encourages parents to play these apps with their children. After all, apps are valuable by what you do with them, not by what they are. Gonidakis stresses that the iPad/iPod is just a tool in our toolbox of learning and language. It does not replace speech and language therapy and will not provide a “quick fix” to your child’s need.